February is a long, cold month. To me it’s always been the toughest month of the year. This time I’m attacking February with a dose of bright and shiny meals that have the ability to transport us. Mickey took us to our first fish taco stand when he lived in Newport Beach California. It was heaven and ever since we’ve enjoyed fish tacos pretty much any which way we can get them. These are just so fresh and healthy, and colorful and crispy and DELICIOUS AND, AND, AND……… I guess what I’m trying to say is that they’ve got a LOT going for them. Pre-heat oven to 500. Place cookie sheet in oven to pre-heat as well. Pat the fish dry then coat with flour mixture. Place on HOT baking sheet that either has been sprayed or has a silpat liner and bake until cooked through approx 3-4 minutes on each side. That’s what I needed, a great baked fish recipe! We’re going to try these tacos when Katy gets here. Just six days from today!!! Can you tell me how to make chipolte and/or adobo sauce from scratch? The stores in Roatan don’t carry either one. I think I can get the raw ingredients and make some myself. I just need a recipe. Thank God, because I want one of these right now in the WORST way! We don’t have chipolte or adobo anything down here. How can I make some from scratch? It must start with peppers. We have a plethora of peppers. Do I grill them or sear them or smoke them or all of the above? HI PATTY! Do you have any smoked paprika or other smoked pepper? I don’t think the chipotle is the be-all end all -it’s just a nice touch. It’s hard to find dried chipotle already ground up – even here. Maybe Katy could bring a can of the chipotle in adobo’s down with her? I think it would be a big pain in the keaster to smoke a pepper for the small amount you need. We love Baja-style fish tacos. Yours look absolutely fabulous! Great garnishes. You’re right. This dish brightens up the day with all those beautiful colors and exciting flavors. I should keep that in mind just in case I move to a cold and gloomy country. I love that you baked the fish here. 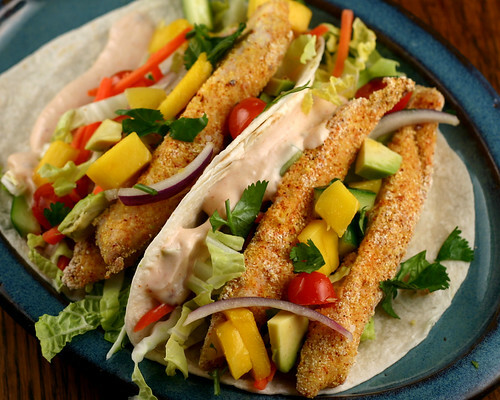 Usually when you see a recipe for fish tacos the fish is fried and aside from being less healthy its a mess. Love the chipotle with the cornmeal too! Well done Mary! I see you have made these healthy. Good job. Never tried fish tacos Mary, can you believe that??? These sound great, look even better than great, and the family so loves Mexican food, I just have to try these soon, very soon. Thanks for the inspiration. Ah, those look like summer to me. I want. This looks awesome! I love fish tacos. This looks crunchy and spicy and delish. Thank you for the wonderful comment on my site. I appreciate it! The beautiful finished product aside, I also love every single ingredients you put together with, especially chipotle! Congrats on making top 9! Such a nice and colorful recipe. I would agree! Fish tacos have a lot going for them. My husband and I love, love, love them. I like the way you made yours. I think mine turn out different every time! I have certainly not ever seen a tacos looking this good. Wow, I can just imagine the crunch on these babies….I am so impressed that you made your own tacos too!!!! Oooh, all the goodness of a crunchy fish taco, but without quite so many calories. I like that! Man that is a delicious-looking photo. I just picked up some tilapia fillets at the store yesterday. But I’ve always been wary of fish tacos… they just sound gross. I think you’ve convinced me to try them out. I’ve bookmarked this recipe to make with cod tomorrow! Sounds excellent! And the photo is fantastic! We used the George Foreman to “bake” them. It worked perfectly. We used Sea Bass. It’s my new favorite fish!!! I always liked Halibut, but I think Sea Bass is even better. Kind of like a large sun fish. Oh, my it was delicious in the tacos. We also LOVED the Mango Salsa…AND the Chipolte sour cream Mayo sauce. Thank you for posting this – my family LOVED these. So tasty and easy for a weekday meal. We didn’t make the mango salsa, but I look forward to doing that next time. We served with soft corn tortillas, diced avocado, shredded cabbage and raw onion. And the chipotle sauce was perfect! Glad you liked them and thank you for commenting! Thanks! I loved this – it was exactly what I was looking for. I used fillets of frozen flounder from Whole Foods, and riffed on your recipe with a panko coating on the fillet strips. No mango in the house, so I made a pineapple salsa with fresh garlic, cumin, cayenne and fresh mint. These were terrific alongside mexican beer served in a salt-rimmed glass. Yum! Hi.. I need to cook ‘mini’ fish tacos for maybe as many as 150 people next Friday at our Church. We do a Lenten soup kitchen too, but I’m doing the tacos as a little extra. I have a bargain fish fillet- Swaii (bosa..) and want to bake on cookie sheets- several to setup for a quick serve as we have only 30 minutes to ‘gett’r done’ before a retreat speaker starts. Do I thaw fish two days earlier? I pat dry and roll in a seasoned flour/breadcrumb and put on hot cookie sheet, right? I want to cover them w/ foil and olive oil to not stick and cleanup quckly. Since i’m going so quick, I’d rather not ‘flip’ them, but w/ coating I’m sure I need to.. I figure w/ mini(3-4″) corn tortillas, 2-3 oz. of fish B4 the cabbage is plenty.. then pico- de gallo and a cream sauce or salsa- each persons choice..
Input- never done this.. ugh! We need to start early and do an assembly line..
I’ve worked in commercial kitchens my whole career, and have done extensive catering in that time – this is one recipe I would never use to serve 150 people. You can, however do a fish taco without the coating. I have never worked with Swaii and have no idea how it holds up under so much handling in the cooking and assembling. Good luck to you!